Sanghadarsini writes from Triratna’s centre in Essen, Germany, with news of their upcoming Central European Triratna day. She says - “This year we will celebrate in Gent (Belgium) on the 9th and 10th of April. 'We' are the Triratna Sanghas from Holland, Belgium, Germany, France, Poland and Russia. It is a great opportunity to meet up again and to make connections with each other. The theme of this year’s celebration will be “Triratna, We Are Buddhists” - a celebration of what we as a Buddhist movement have to offer the world. “The weekend begins on Saturday with a more social programme to give us all a chance to get to know each other. Upeksadaka and Bart will give us a guided tour of the historical city of Gent. For the ones who want to get away from the city, there will also be a nature walk. 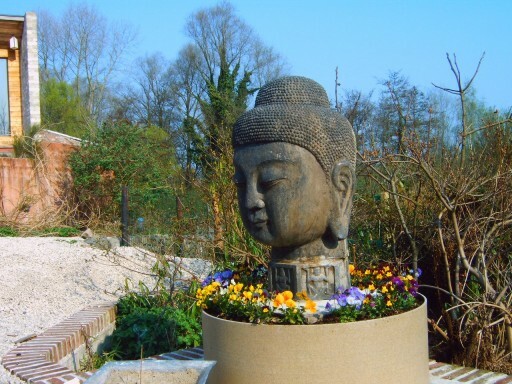 At 6 pm we will all meet up again at the Buddhist Centre in Gent for dinner and a cultural evening. “On Sunday Triratna Day will be celebrated at the beautiful Seminar Centre owned by Chris and Katelijn, both mitras, who have kindly made the place at our disposal. The place is the 'Blauwe Poort' in Melle. It is set in large gardens, with sculptures, ponds and wet lands, just inland from the banks of a wide river. It has the taste of a retreat centre, being away from the busy world. The day will have a Meditation; presentations from the different Centres; a talk by Arthamitra and a 7-fold Puja celebrated in 3 languages (German, Dutch and French).